My speed of selecting and translating Zhou Yaping’s poems can’t catch up with the poet’s speed of writing. Zhou Yaping told me that he had three new poem collections on the way of publication recently. With the Public (Zaigongzhong 在公众) is the first one that comes into our view. It was published by Jiangsu wenyi chubanshe and now it is available online for purchase at dangdang. I translate two new pieces from With the Public and post them here. Of course the translation is tentative. But even just from these two small pieces, we can see Zhou Yaping continues his game of playing with the abstract and the philosophical, which is his way of addressing emotional issues in his personal life or expressing his ideas about the general state of life. Only one triangle is asleep. every designer, artist and computer geek. It doesn’t yet disperse at midnight. Note: the illustration of the poem Well-behaved Art is created by Bushibei@weibo. The two poets Zhou Yaping and J.H.Prynne have a long friendship, which can trace back twenty years. Last night, they had a reunion in Beijing. It’s interesting that two people who don’t know the languages of each other can enjoy so much their company. Mr. Prynne leaves a note in his book for Zhou Yaping, which says, “This book is for a very special friend of quite long ago, in Suzhou, Zhou Yaping, in most happy reunion, Beijing July, 2014.” I take this opportunity to post their communications in articles “of quite long ago.” Both the following articles originally appear in Original: Chinese Language-Poetry Group, a special edition of Parataxis: Modernism and Modern Writing 7 , 100-101; 121-124. They’re now also available online at http://jacketmagazine.com/20/pt-chinese.html. It can be said that we have had no early youth. I was born in the 1960s, which was a special period. The robbery the Cultural Revolution forced on us was very harsh, but some who lost a little material wealth believe that only they were very unfortunate. For me at least, I lost a vivid, visible decade. Nevertheless, it also almost deprived me of innocence and political enthusiasm which yet might prosper in the future. I chose art, writing. I have refused those impetuous and unrealistic illusions. Our radicalism, extreme and uncompromising, is like a revolution as well, but not a revolution against people. Of course, I know that a pious service to art will harm the national interests and in turn cause us to commit crimes; however, the true spirit of art will defend me. In China, the usual accusation against us is: cutting apart ideology and art. Those precocious and sophisticated political critics, as long as they cannot determine the meanings of characters and phrases in our poetry with their limited thinking, will assert that our ideas are obscure, game-like and playful. This is more or less like saying that if the lines they desired were not realised by Klee or Miró, they will criticise them for being simple, childish, and meaningless. The history of Chinese poetry has been determined by the authorities to be a tradition of ‘obscurity’ and ‘games’, including even the Song dynasty. In this way, they completely deny all the painstaking efforts of experimentation in poetic form itself; consequently contemporary poetry has no freshness, surprise or fascination. Refuses any healthy and active forms of life. In 1988 or so, my friends (especially Che Qianzi) and I began to pay close attention to common objects; this attention differs from the American style that influenced Chinese poets profoundly at an earlier time: namely, the mere interest in facts. The latter brings mediocrity to existence and writing. It is correct to say that it has gone astray. But the attention to common objects resulted in turning our attention to the research of language events and of language itself which have absolute control over objects. Chinese poetry, because of its concrete written characters, is essentially different from poetry in English (or other phonetic writing systems); it is also certain that Chinese poetry is by nature magical and painterly. Like the Book of Songs. The concise Chinese syllables, compared with phonetic writing, lack richness and diversity. However, there is simple visual potential. In my eyes, it is not restricted to code characteristics, but in addition contains a kind of congenital rules of the game, which from the very beginning long to unite with paper. This union, with our perseverance, can now adhere to its old direction. A written character, or the concrete shape of a character, resembles a piece of paper, or rather the concrete shape of a piece of paper; I think they carry weight eternally. When I say this, what I express is not my wish for a pure poetry, but a concrete, physical attitude. 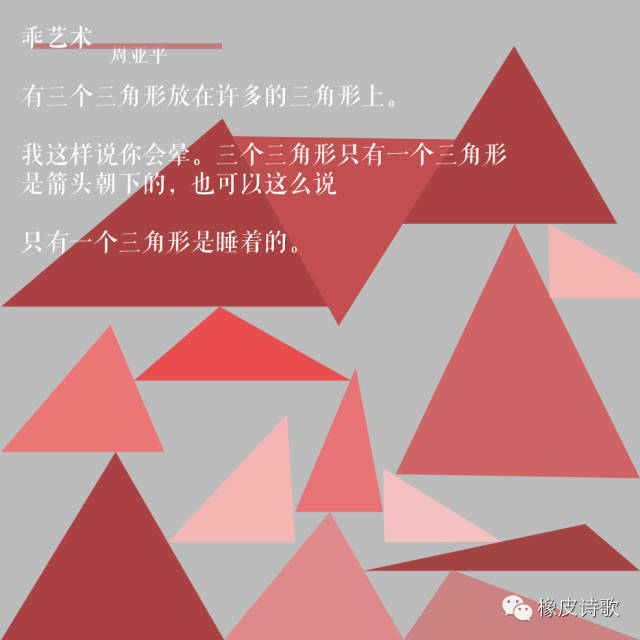 At present, in Chinese poetry, it is correct to say that the truest crisis does not come from politics or the political reactionaries, but from the imitators of spiritual epics, emptiness, affectedness and the lack of modern spirit will directly lead to the poverty of paper, robbing it of importance. With hard effort, we must even dirty a sheet of paper at first instead of leaving it blank, with the purpose of awakening the deep abilities of affirmation and association relating to written characters. This ability has been detracted from by the secretive character of our race throughout the long history of poetry. It must be pointed out that the language experiments we are pursuing, after much passionate labour, have been welcomed by a fairly large circle. Not by the authorities, on the contrary by the freedom and choice of those friends who are even younger than ourselves. We, the quick and chaotic metamorphosis and the happy principle in the course of metamorphosis, enjoy the abundant trust they grant us. When our solid work and resolution are regarded by some real cheats as a mockery, these friends have never felt hesitation or disappointment simply because they cannot spot in our poetry the elements that critics think poets should imitate. An uncompromising form of art will become increasingly well-developed and exquisite, whose revolutionary thoroughness cannot be attained by politics or anything connected with politics. All will have to go through the hands of poets. Within the great aquarium of language the light refracts variously and can bounce by inclinations not previously observed. Some of the codes will unfold with merely adept connivance, others will swim vigorously into and by circulation inside their own medium. If you can imagine staff notation etched on the glass you can read off the scales, da carpo and mirror-folded. ‘The fish of writing melts into the face of the water’ — thus the iconic boundary features declare, by difference and by movement of an intense register, shifts of focus that will skim and can turn about on the smallest coin. The colour force suffuses a diagram, there is a play within the box which says ‘play carefully’ on the outside cover. Energy prevails by conversion about the axis of activity, the object-perimeter tingles with our hues, your readiness to jump ahead. This is a ‘world’ all right, the rules for civil adherence percolate into a grammar made iconic by gaps and outbursts of intense writerly variance. The history of contradiction lies in the ground of the body image as a co-ordinate of written sound-play, so calibrated with signifying exchange that every part offers an assembly ‘in the swim’. I first met the kernel pair of the ORIGINAL collective near to the banks of the Imperial canal in the eastern city of Suzhou, during the summer of 1991. We had intent discussions and readings in both directions. The exotic remoteness of that location at once bids to compose an allegory of displacement, which in turn demands a fully prepared resistance. Plants grow in the same way, upwards. People eat lunch, eye each other, words fly out of mouths. Does the subject-position bind to the life-world by a different syntax? Well, these poems and writings set out a composite text of investigation into such imponderables. Zhou Ya-ping’s shadowessay speaks of Wang Xu-bing’s paintings, and this prolific oeuvre (which he shewed me, again in Suzhou, in the summer of 1993) reveals the vigour of a remarkable astuteness, reckless and specific: ‘extreme abstraction should contain emotion and enthusiasm’––and perform also the trace of such containment, as these pictures do. This group of writers and artists and critic-theorists has devised by circulating and interchange an intense life of creative production, which this anthology demonstrates. It has been prepared entirely by the group, with no outside selection or arrangement: the very characters for their name on the front cover come from Wang Xu-bing’s hand. Or spiritual pathos, but to hold in place a sense of explicit object-horizons, as a tacit intertext interleaved into daily life. There’s still no free lunch, though anyone can write the word for it who can hold the pen. Or the brush. This language of the written character is painted on to the paper, abstracted from the world-surface, whatever now is the more abbreviated practice. Its iconic deployment by stroke play and contexture makes a traffic with the eye worked by a different ground-plan. There is lexical transference and collocation, but also the sense of the occasion ramifies within the stroke-field itself: not by symbolism or imitation or assigned convention but by homologies intricately linked to the affective diagrams of social consciousness and activity. The writing in this collection resides and disports itself very intently within the field of language-presence and language-process. The routine wiring of the circuit to external devices has traditionally proceeded by what’s described here as ‘allegory’ and ‘parable’, and by such old chestnuts as ‘the music of poetry’ (not to mention ‘direct treatment of the thing’). Of course, anti-allegory and beast fable are sarcastic examples of language trapped within, or artfully escaping from, the demands of a forced outcome, reminding the reader how such transposed devices have traditionally adopted the constraints blocking off other options. But the tail does not wag the dog, even when it barks all night. To prevent the leakage of energy into pre-determined frames of control, several ancient Chinese traditions of wit, scepticism and cantilevered invention have been brought into newly explored relations with western iconography and the art-slogans of selfhood. Not only the ellipsis of lyric epigram but also the exuberance of the fu or rhyme-prose join up with the frequently deflected currents of Chinese poetic experiment in the twentieth century; here, to centralise the contingent via its force for total candour, or ‘to drive out all lyricism’ by rapid cross-talk and studious hooliganism. Or indeed, both at once. All this is likewise also decoy manoeuvre, reclaiming the margins by transferring their negligence back into spirited invention. There is a running stream half-visible alongside, but for those not tuned into these features the interplay of this writing in its English form can still provoke analogous recognitions. ‘The world is small’ opined Confucius, standing on top of Mount Snowdon and chewing a banana. The English text can disclose to the English reader one truly essential feature: this writing moves about its native element with a good deal of unusual compression and exhilaration but it is not exotic. This is the language of a world, not a fancied ping-pong utopia, and its living currency is what makes abstraction and invention into such considered forms of daring. Much is not said and much has been folded back into the components of character-writing, by intense punning and lexical wit and adoptive idiomatics; but the sound-plays of counter-active ceremonial fizz and lurk and conduct intellectual experiments right up on the surface of this swirl of signification. The thought-play within the colour registers and utterance forms sets out vividness as an exploratory instrument. I put up these thoughts and comments myself, because I have an extremely strong confidence in these translations. A very extended and focussed labour of attention has attended their coming-to-be. How to get inside the detail of the play and the run of a local progression d’effet has had to be balanced with how to maintain an appearance of naturalism that won’t deceive the close attention of a reader for a moment longer than is useful. I think these versions shew a sustained brilliance, of intelligent, patient alertness and formal energy, mediated through layers of detailed discussion and comparison with native speakers so as almost completely to submerge this process of consultation beneath the texture of performance and its prosodic exactness. No translation will exhaust its originals, even though it may tire them out; but there are many forms of connivance with tacit sideways compromise, and the committed good faith of Jeff Twitchell’s accomplishment gives the non-Chinese-speaker an altogether fair chance of finding in the ensemble of this collection an interaction that is specific and hyper-active. At one stage we thought to include some of the Chinese text, maybe even brush-written, but the ORIGINALS themselves have countered this idea, because it would suggest exoticism or extraneous willow-pattern ornament; to them, we are the exotics, with our credit-card view of the speech act (how crude, to set the choice as text or graphics). Angus Graham wrote of the philosopher Zhuang-zi (c. 320 B.C.) that ‘in one of his many aspects he is himself a true sophist, fascinated by the subversion of received opinions and intoxicated by the plunge which imperils rationality in the course of discovering its possibilities. His is also, even in the flow of reason itself, a poet who changes course as new insights explode, elliptical even when most logical’ (Disputers of the Tao, p. 178). The roots of the ORIGINAL anthology are tangled in much contemporary contra-diction which exerts a certain pressure; but they also run deeply into the ancient substrata and continuities of the language culture, and this too makes up a vigorous presence that I believe the close reader of the English versions can draw energy from, and acute enjoyment.